Trails family medical is not just a clinic but an endeavor by an excellent family doctor Dr Bikas Sharma to provide VIP medical care to his patients without VIP fees. The practice is based on feedback from patients and strives to fulfill the promise of a compassionate family doctor providing low cost quality care. For patients without insurance in Las Vegas we are a low cost clinic,very affordable, accept walk ins and same day appointments.We are here to serve the Greater Las Vegas community providing affordable low cost healthcare to all. We accept Aetna, UnitedHealthCare, BlueCross, GEHA,Medicare, Mailhandlers,Healthscope Benefits,Medicaid(straight only no HMO medicaid) and many more. A detailed list is available on the appointment page. If you do not have insurance office visit is only $100. We also offer weight loss services. We are here to meet your primary care and urgent/ quick care needs in Las Vegas.We have inhouse EKG, Urine testing, Ultrasound and Allergy testing and Immunotherapy services. We also offer some specialized testing like the EVOX system for assessing Brain Health and cognitive disorders and Biowave Pain Treatment and low cost laboratory services for uninsured patients. You would get personalized care where everyone knows your name and you are not just another patient! You always see a doctor. You will never see a Physician Assistant or a Nurse practitioner. Walk in patients should expect some wait time! Same day appointment may be available, Walk ins welcome! The rates mentioned here are discounted rates applicable only to uninsured patients and subject to change. Other restrictions may apply to other services mentioned. Please call the clinic for details about services. Call 702-750-1744 or go to appointment page to make request appointment online. Laboratory services at higly discounted rates for uninsured patients. Allergy testing and Immunotherapy services. * please note that the rates are over and above the office visit $100 charge for the uninsured patient. Rates are subject to change. please call us at 702-750-1744 if you have any questions. 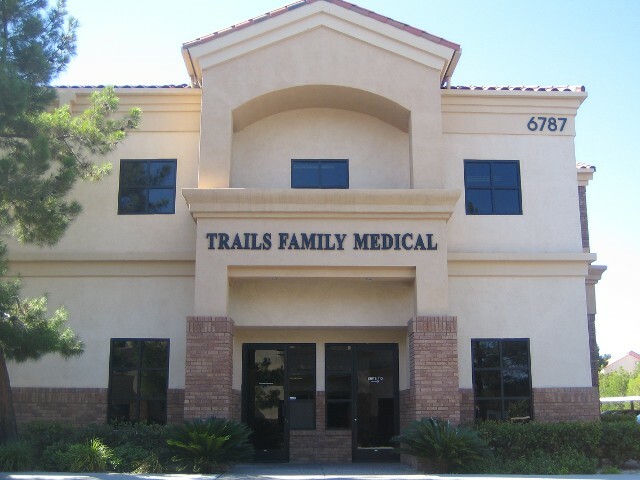 At Trails Family Medical, we strive to provide VIP medical care without VIP fees. Low cost office visit for uninsured patients $100 only. We accept most insurances like Aetna, United HelathCare, Blue Cross Blue Shield, GEHA, Medicare and many others and we will try to see you the same day if you call us or walk in during office hours. Are you visiting Las Vegas and in need to see a doctor? We are very close to the strip. Just walk in to our clinic.